February 14, 2014 -- It's no secret that radiologists need to increase their visibility with referring physicians if they want to ensure the future health of their specialty. One way to do that is by integrating radiology reading rooms into clinical areas, according to researchers from NYU Langone Medical Center. 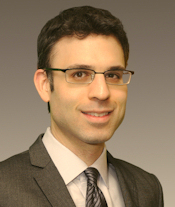 In an article published online in the Journal of the American College of Radiology, a team led by Dr. Andrew Rosenkrantz shared how staffing a reading room in the institution's urologic oncology clinic for a few hours a day yielded a host of benefits, including a perceived drop in unnecessary repeat imaging studies. It even facilitated opportunities to review studies directly with patients (JACR, January 31, 2014). "Ultimately, we are demonstrating a fairly simple operational initiative that had clear benefit to our referring clinicians and patients," he told AuntMinnie.com. The field of radiology is in the midst of change, with radiologists being expected to offer a wider array of services to their practices that advance the value of care, Rosenkrantz said. As a result, the researchers sought to assess one such initiative in their own center and provide a model that could be emulated elsewhere. Physicians from the urology and radiology departments teamed up to design an integrated radiology reading room within a new office-based outpatient urologic oncology clinic. The room was located within 10 ft of the space used by the clinic's urologists to review electronic medical records and to consult with nursing staff, and it was staffed by one of six fellowship-trained abdominal radiologists. Dr. Andrew Rosenkrantz from NYU Langone Medical Center. The radiologist was available onsite for consultations during a three-hour shift and also interpreted imaging studies from abdominal imaging worklists on the PACS. During a five-month period, radiologists working in the integrated reading room kept a log of their consultations. The urologic oncologists also filled out a survey on their experiences with the reading room. Over the study period, the onsite radiologist had an average of 1.8 consultations during a three-hour shift, with a range of zero to eight consultations. Of the consultations, 52% related to outside imaging studies brought to the clinic on disk and 43% were to discuss internal cases. The remaining 5% involved direct review of imaging studies with the patient. Before the integrated reading room was implemented, radiologists weren't able to remotely review these outside images while communicating with the clinician in real-time over the phone or by email, as the studies weren't available on the institution's PACS, according to the researchers. "It was the presence of the radiologist within the integrated reading room that allowed these consultations for outside imaging to be completed in a timely fashion," the authors wrote. "This timeliness enables the clinician to incorporate the results of the consultation into patient management during a single patient visit. Otherwise, the clinician would need to seek review of the outside imaging at a later time and subsequently follow up with the patient regarding any change in management." While the existing model is to send images digitally to the local PACS to be interpreted by radiologists at a centralized reading room, "these approaches fail to achieve the other benefits we describe of face-to-face clinician interaction," the authors noted. Because it offers an easy mechanism for clinicians to receive prompt in-person review of outside imaging, the integrated reading room can help lower the number of repeat studies, according to the group. The urologic oncologists at the clinic were also pleased with the integrated reading room. They reported that the consultations with the onsite radiologist were beneficial in more than 90% of cases. "There were tendencies to view consultations as affecting patient management in most cases, to be more likely to seek consultation for outside studies when the radiologist was onsite, and to be less likely to reorder such imaging when the radiologist was onsite," the authors wrote. These types of integrated reading rooms could be very valuable for the future of radiology, Rosenkrantz said. "We will be evaluated by our ability to add value, rather than to simply perform and interpret studies, and it is these kinds of communications that can enhance the role of radiologists, not just of radiology per se," he said. "We as radiologists need to think broadly of the full spectrum of ways in which we can interact with patients and clinicians, and seek out and take advantage of additional opportunities for contributing to care, beyond image interpretation." For those institutions thinking about implementing a similar integrated reading room, Rosenkrantz emphasized the importance of interdepartment communication. "We had an existing strong collaboration with the urology department prior to the start of this, which helped things greatly," he noted. With the success of the urologic integrated reading room, similar integrated reading rooms are now being set up for other departments at the institution, Rosenkrantz said. "We have this currently in our cancer center, with more examples on the way," he said. "Consistently, the response from clinicians is positive."